Catch a Birthday Wish, That I was anywhere but where I am, because this "Princess Louise" turns out to be a starvation ship. Nothing to eat or drink. Rotten luck. Arrived at Embros this morning at 10.30. Party went ashore to get fruit &c. Saw some of our new Monitors, also a new airship in flight. At present 6.30pm we are moving full speed ahead for Helles again. A few "subs" about these quarters so have to make the pace somewhat. Destroyers on either side of us. 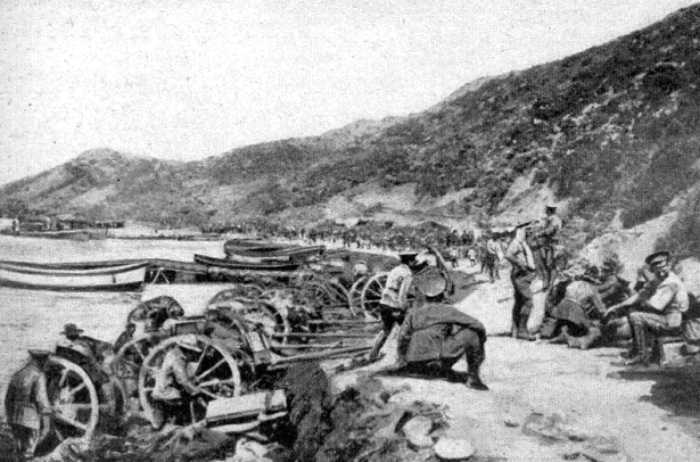 Are to pack up the 1st & 3rd Batteries & then Westward ho for Anzac & more fun. Loading 1st & 3rd Batteries most of the night. Arrived at Anzac about 3am. Got the right section of the 3rd ashore but headed back to Embros again because it's too risky to hang about that quarter after day break. Believe we disembark tonight. Left Embros at dusk. Landed at Walker Landing later. Had a good view of a destroyer shelling the enemy positions by searchlight. Disembarked at 4.30am. 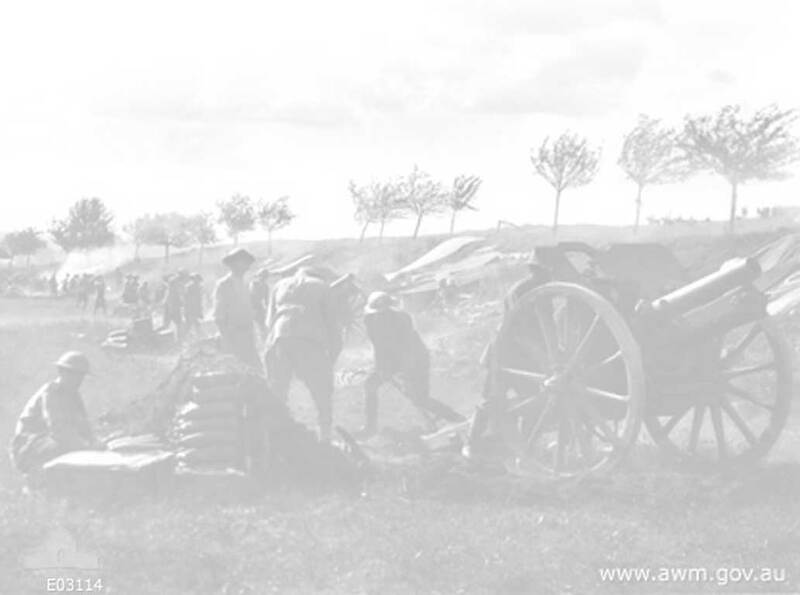 Got ashore at 5.30am, 31st 1915. Acting Q.M.S. all day. Had a screw around and managed to strike gold in the person of a Staff Q.M.S. who fixed us up royally with food stuffs. Great position here. All cliffs and ravines. Had a swim off the pier and some insignificant Bty shelled us to blazes. Got a few also some mules. Snipers fairly plentiful too. Rest of right section get ashore later tonight. Slept like a log. Had none for three nights. Taube amusing itself by dropping bombs. Very hot day. Awaiting orders to shift into position somewhere. Edwards, Gilligan & Glover old members convalesced joined us today. Chas & self went for a stroll this afternoon. Couldn't see anything to shoot so came back before 8pm. Have just got orders to shift. Awaiting teams. Mail arrived. Caught a few. Don't know where we're off to but believe it's Anzac way. Anywhere for trouble suits us. Arrived at destination (Shrapnel Gully) some unearthly hour this morning. This place doesn't belie its name either. Had a good view of the guns shelling one of our batteries perched away up on a ridge to our left. Awaiting orders to go into action. No water in this place Get issued with a gallon a day which is to do you for washing, drinking & messing generals. Don't want to spit much. Some talk of being relieved & going away to Lemnos for a spell. Some of our chaps (what's left of them) don't half want it either. Out of 98 men to land 76 are casualties. Lovely day today. Was down at the beach this morning when a gun nick-named Blacky Bill sent over a couple, & snuffed a couple of mules & a driver. Got news (good) that we are leaving here for our spell. Been getting gear &c packed preparatory to leaving. Things pretty quiet. A few stray shells about. Left bivouac at 9.30pm Got down to the beach (Walkers Pier) at 10.30. Boarded a lighter at 12pm & pulled alongside of a small steamer & embarked later. On board SS "Elkahera" heading for Lemnos. Great beano all morning. Great after scrapping. Quite a diversion from slaughtering. 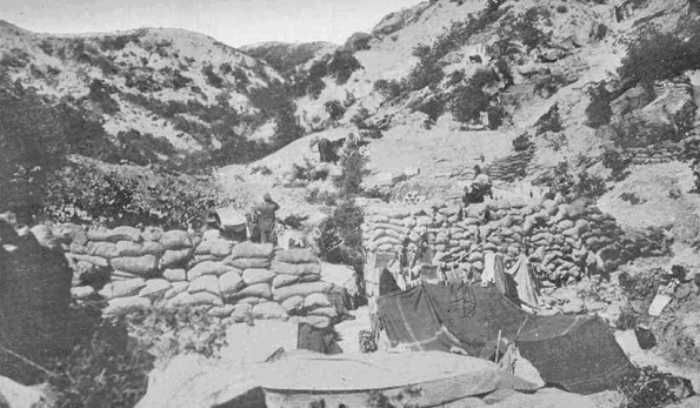 Arrived at Mudros West and proceeded to our Rest Camp. Had a most amusing happening on the way. All of us (about 250) had to wade across a stream about ½ a mile wide. Take off all clothing and prepare for immersion. Great, saw a ("nurse") some species of an unforgotten race I once knew. Arrived here ok and attended a concert at a YMCA. Didn't half enjoy it either. Great day. A bit rainy but is a welcome change. Had a bath in fresh water. Used a bar of soap during operations. Struck several boys from Nelson, who are spelling here after playing the good old game on the P. Saw Bob Woods & had a long yarn to him. At night went over to Queen Alexandra House with Chas, and saw Sid James. Had a long yarn to him and while there a squall came up, and we had to hold the tent up for some time. Coming home after the fun I saw about a dozen tents blown down. Lovely day after last night's squall. Things in general look very fresh, except some of the tents which are perfect peaks of nature. Norman, Pearce, & self went for a stroll to one of the villages & speculated in several comforts particularly in the eating line. Possessed of an absolutely ravenous appetite nowadays. Struck Billy Lucre in one. Greek village. Bob Woods came over for tea. All of us went to a concert in the NZ lines at night. Very good. Saw some more "women". Gee, they are strange.